Powers/Abilities: Empowered by Odin to mystically control the vapors of time, Volla has the power of prophecy. She can summon mist-like visions of future events which are visible to all those around her. It is believed that Volla can never tell a lie, only share what she sees. A member of the Norns, in life Volla possessed the conventional powers of an Asgardian god: superhuman strength (lifting 25 tons), resistance to injury, and longevity. Volla also had numerous magical skills primarily in controlling and perceiving time. In death, she has become more sensitive to the impending demise of others. (Thor I#127/2 (fb) - BTS) - Ages ago, Odin bequeathed the power of prophecy on the Norn Volla. Now able to see the future by mystically manipulating the vapors of time, she served as Odin's advisor. (Thor I#303 (fb) - BTS) - Thanks to her new role as seer, Volla became the one member of the Norn race that Odin explicitly trusted. (Thor I#127/2) - Alarmed by Volla's visions of Ragnarok, the foretold destruction of the Norse gods, Odin summoned Thor and his argonauts (Balder, Loki and tens of other Asgardian warriors) to hear what she had to say. Summoning the vapors of time, the prophetess showed them what she had seen: the first signs of Ragnarok are a darkening of the skies and the coming of soul-searing frost and never-ending storms sweeping the land. The growing fear will turn brother against brother until Loki leads the forces of evil over the Bifrost bridge into Asgard, first fighting Heimdall and then facing Odin, Thor, the Warriors Three and the warriors of Asgard. Thor and Loki will face off against each other until the oceans themselves begin to swell and rise to mark the coming of the final enemy: the Midgard Serpent. (Thor I#128/2) - Volla continued her tale of the fall of Asgard, mentioning the deaths of Thor and the Midgard Serpent and the fact that when all was dead and gone, Surtur the fire demon would rise to completely destroy the realm eternal until after untold eons new life would find a way. After her predictions were done, she took her leave of the Asgardians while Loki tried to downplay the old woman's stories. Odin was furious, declaring that Volla was incapable of uttering falsehoods. He then pointed out that her visions predicted that Loki himself would be the cause of the coming of Ragnarok. (Thor I#479 (fb) ) - Volla came to Odin after having a worrying vision about the death of Thor. At first, Odin was not interested in the hag-witch's tired old warnings of Ragnarok. However, she managed to catch his interest when she revealed that Thor would perish well before Ragnarok if Odin allowed him to stay in Asgard. As a result, Odin began to plan a complicated scheme to save his son by "banishing" him to Earth and bonding his essence to that of mortal physician Donald Blake. (Thor I#200) - Volla was once again brought before Odin, Thor, Loki and most of the Asgardian warriors to share her visions of Ragnarok. However, this time Odin did not blame Loki for the catastrophe, instead the ruler of Asgard revealed he had ordained the horror himself, deeming the world was in need of a fiery cleansing. (Thor I#274 (fb) - BTS) - Soon after she revealed her visions of Ragnarok, Volla died under unrevealed circumstances. Her spirit found its way to Hel. (Thor I#274) - Still desperate for her advice on how to prevent the coming of Ragnarok, Odin traveled to Hela's realm to seek the counsel of Volla. The disembodied spirit was less than pleased to see Odin had come to disturb her eternal, dreamless slumber but did oblige him by revealing it would take the death of the supposedly unkillable Balder the Brave to set in motion the chain of events that would lead to the twilight of the gods. Confused by this, Odin had no time to ask Volla any more questions because the ghost of the prophetess fled when she sensed Hela's approach. (Thor I#277 (fb) ) - Eager to find out his part in bringing about Ragnarok, Loki went down to Hela's realm where he requested to speak with Volla. Hela summoned the seer, who once again recounted all she'd seen about Loki's role in the coming tragedy, including details she'd only seen since dying like the way Heimdall would perish. (Thor I#303/2) - Volla eventually became a close confidante of Hela's, allowed to remain in a semblance of her former form instead of existing as a whisp-like ghost. (Thor I#479 - BTS) - Odin explained his recent actions, which saw him essentially banishing his own son from Asgard, by revealing it was all caused by Volla's visions years earlier. 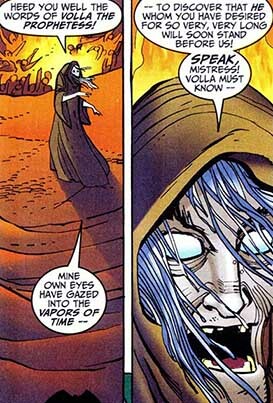 (Thor II#1) - After having gazed into the vapors of time, Volla learned that soon Thor would die and come to Hel. She went to see Hela to find out how the ruler of the shadow realm felt about this. The overjoyed goddess of death sat on her throne, delighted to know that with the arrival of Thor, her realm would stand complete forever. (Thor II#2) - Volla was overjoyed when her prophecy came true and the spirit of Thor (having fallen fighting the Destroyer) appeared in Hela's realm. The goddess of death told her seer to keep quiet, but both were surprised by the arrival of the mysterious Marnot. Volla immediately sensed the stranger was actually one of Odin's ravens empowered by the Odinforce. However, before she could reveal this information, Marnot used his power to fuse her mouth shut, making it impossible for the old seer to utter even a single word. While she struggled to deal with the harsh reality of her new existence as a mute, Marnot made sure Thor was granted a new lease on life by fusing his essence to that of the mortal Jake Olson. Volla and Hela were powerless when Thor's spirit left the realm of the dead. (Thor II#29) - Enthused when she had a vision of the death of Hogun the Grim, Volla rushed to tell Hela of his imminent arrival. After insisting Volla kept her calm, Hela then travelled to Midgard, ready to claim the life of the mortally injured Asgardian. (Thor II#32) - As a result of Malekith opening the Casket of Ancient Winters, Volla and Hela found themselves covered in snow and ice in the Hel realm. Hela told the frantic Volla to calm down, after all: this too would pass. (Thor II#35) - Volla accompanied Hela to a remote part of her realm even she seldom went to. She watched incredulously while Hela sent one of her cyphers disguised as Skurge the Executioner back to Earth in a new host body. Curious to find out Hela's reasons, the queen of the dead simply claimed that she craves certain souls and that even her godly patience had its limits. (Thor II#43) - Hela had little time for Volla's protests. 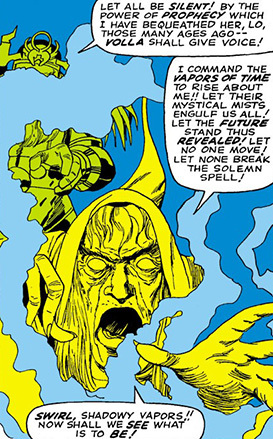 Even though the seer was aware the death queen's current plan would end in disaster, Hela insisted she kept quiet because Hela's desire to have Thor's soul was beyond anyone's understanding. A little while later, Thor appeared before Hela and Volla along with Thor Girl, the dying human Dale Krogstad wrapped up in the affair and the Skurge imposter. Using the Odinforce (he newly inherited after Odin's temporary demise), Thor revealed Hela's scheme. Though the prophetess had already announced this would happen, Hela was still astonished her quarry had learned the truth and already possessed the Odinforce. As a result, Volla urged her mistress to beg Thor's forgiveness, after all he was their master now that he controlled the Odinforce. Hela freely let Thor's party leave her realm, with Volla extatic they survived the encounter. A decidedly more morose Hela confided in her that, sadly, they might just have witnessed the beginning of their end. Comments: Created by Stan Lee (writer), Jack Kirby (pencils), Vince Colletta (inks). It's never been revealed just why Volla was "sentenced" to Hela's realm after dying. Perhaps because she wasn't Asgardian, but a Norn but then again. Valhalla has admitted plenty of non-Asgardians.